How do I find the right therapy for my child? Has your family or your child gone through some sort of emotional trauma? Does your child find it hard to concentrate or succeed at school? Do you worry about your child’s behaviour? Family, child and adolescent therapists at Robert Street Clinic might be able to help you and your child through a difficult time or overcome a specific issue. They can treat children, adolescents, parents, caregivers and families who are going through a wide range of psychiatric and emotional difficulties not easily addressed by other methods off treatment. Even if you are addressing issues with a single child it can be useful for the whole family to undergo sessions or for the child’s brothers and sisters to have sessions individually. Some sessions will also include the child and parents or caregivers. Robert Street Clinic also has specially trained experts who can see your child or your teenager on their own – depending on their age, there are different techniques which can be of use, such as play therapy for very young children. Children and young people with severe and long-lasting problems may respond to people and situations in ways that they do not understand and cannot control. A highly specialist child and adolescent psychotherapist can help a child to understand themselves, which in turn can shed light on other relationships and lead to the child feeling less anxious, being more focused and able to learn, and being better equipped to sustain friendships. Therapists also apply their framework of thinking to work with parents, families and carers and to training and supporting other professionals who work with children, young people, parents and families to ensure a child-centred approach. Some sessions of family therapy will focus on helping the parents communicate more effectively, or understand more thoroughly what their child is facing through couples counselling. Just as adults can “talk out” their feelings, so children can “play out” their feelings. This is an effective form of counselling and therapy for the youngest children from 2 to 11 years old because it allows them to use their natural language and environment – toys and play – to express their thoughts, explore relationships and share their experiences. It can be used both as a diagnostic tool to help a therapist understand what’s going on in a child’s mind, or as a self-help tool whereby the child can – through repetition and unstructured play – learn techniques and skills to work through issues they face in the real world. Play therapy can help children work through emotional, psychosocial, developmental, family and behavioural difficulties without them becoming frustrated at their lack of words or, for younger children, without them having to confront the issues head on. 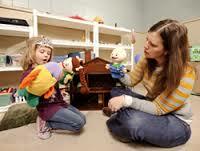 The sessions are held in a therapeutic playroom with toys, which the child themselves will select to play with. The play therapist then enters the child’s play world and joins in at the child’s direction and follows the choices which the child makes. Aspects of play therapy might include: role-playing, storytelling, clay modelling, puppets, masks, sand trays, drawing, music and dance. Non-directive play therapy: in which the therapist observes a child at play either with a traditional sand tray, or with toys, or without toys. This is more commonly used to help children express themselves subconsciously. Directive play therapy: in which the therapist plays a larger role by suggesting topics to act out in sand trays, reading stories with a specific purpose, or choosing games for the child. This is more commonly used with trauma victims. Aspects of play therapy have also been developed to help parents improve behaviour at home or overcome emotional problems.